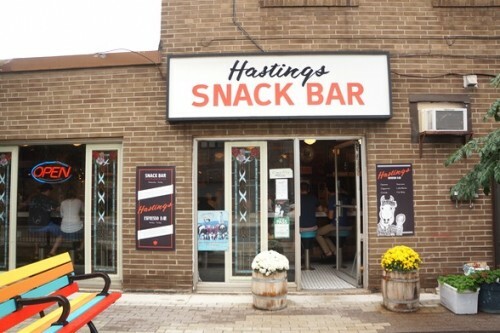 After 50+ years in business, the original Hastings Snack Bar closed down last year when the owner retired. 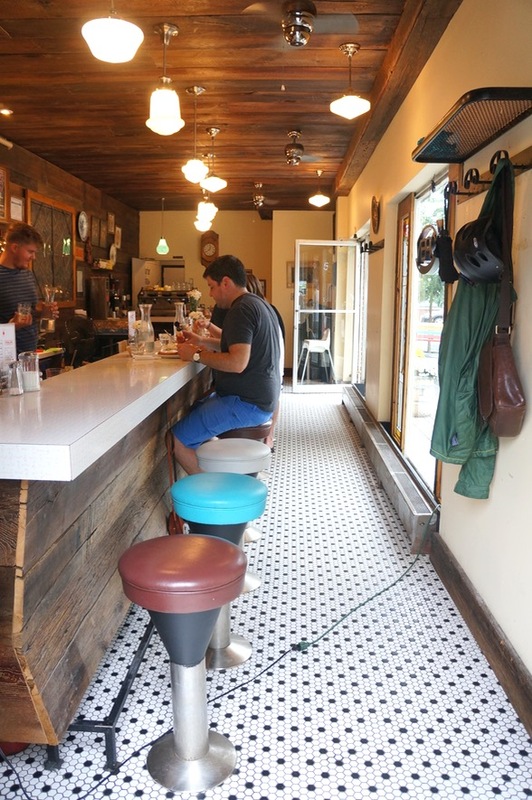 Earlier this year, the tiny diner re-opened with the same name but with new owners – the folks who also own the adjacent Hastings Barber Shop. Hastings Snack Bar is located on Hastings street, just north of Queen Street, in the heart of Leslieville. It’s a quaint little lunch counter with only 10 or so seats. The kitchen is only open Wednesdays to Sundays from 8am to 3pm but Hastings Snack Bar is open 7 days a week for coffee and pastries. They accept cash only but they have an ATM if you’re in a pinch. All the food is prepared in the open kitchen behind the counter which makes it feel as though you are eating in someone’s kitchen. 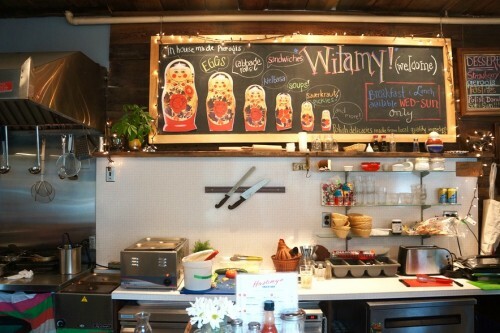 The restaurant is run by a mother-daughter team and the food is inspired by their Polish heritage. From the kitchen, they offer a breakfast sandwich, a Polish Breakfast which includes two eggs, a Polish weenie or bacon, potato pancakes and polish bread, soup, sandwiches (‘build your own’), pierogis, cabbage rolls, kielbasa and a lunch plate. Be sure to check the chalkboard hanging on the wall for their daily specials. On this visit, they were offering a delicious-sounding goulash. To start, we ordered one bowl of the Soup of the Day ($6.00) which turned out to be a white borscht. I love the regular beet red borscht soup so the white version had me curious. 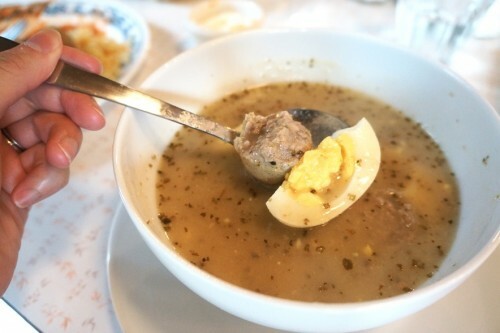 With chunks of sausage, potatoes and hardboiled eggs, the perfectly seasoned soup was very comforting. Unfortunately, it was boiling hot inside the restaurant so I only managed a few spoonfuls before calling it quits. We took the rest to go and it held up very well when eaten the following day. The main reason for our visit was the Pierogis (4 for $5, 8 for $8 or 12 for $11). They offer several variations: traditional (cottage cheese and potato), meat (beef), sauerkraut & mushroom, cheddar & potato and blueberry. They allow you to mix varieties in an order, so you can try them all if you’d like. We had 12 pierogis in total (an order of 8 plus 4 from our other dish) and tried the traditional, meat and sauerkraut & mushroom. 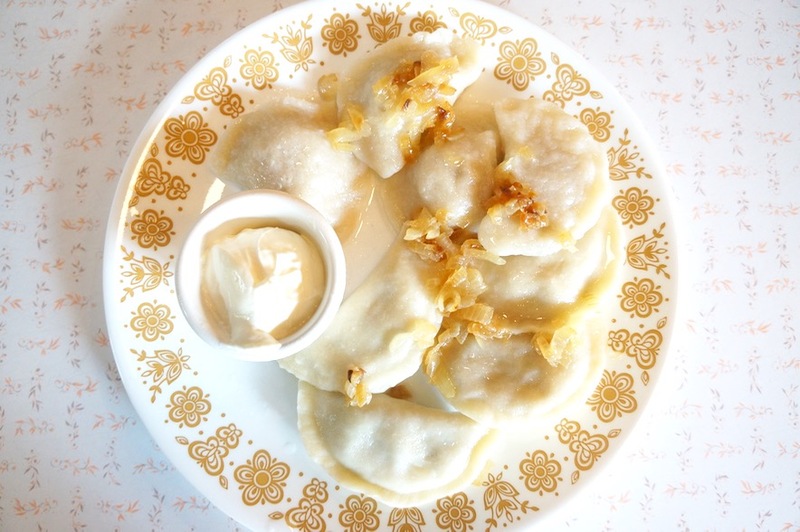 The boiled pierogis come topped with fried onions and a side of sour cream. We’re not pierogi connoisseurs but we loved the dough which had a nice chew. The sauerkraut & mushroom and traditional pierogis were definitely winners. I’m not always a fan of sauerkraut but their version is delicious. It has a nice tanginess to it and reminded me of coleslaw. The traditional filling, which consisted of cottage cheese and potatoes, was creamy and perfectly seasoned. Next time, I’d skip the meat ones as they weren’t particularly memorable. 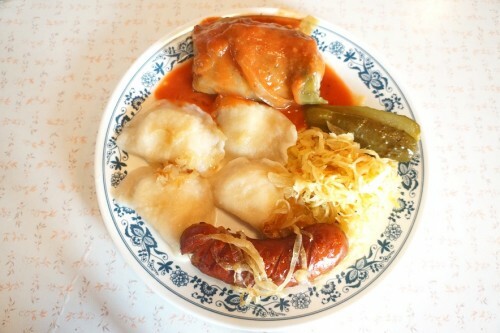 The other dish we ordered was Hungry Tata’s Lunch Plate ­– one cabbage roll, one kielbasa, four pierogis, sauerkraut & a pickle ($13). It’s a great way of trying a bit of everything and at $13, is great value. You won’t leave hungry after tackling this plate of food! The cabbage roll consisted of tender pieces of cabbage wrapped around a dense meat filling (similar to meatloaf) and was topped with a generous amount of tomato sauce. I thought it was pretty solid but it didn’t wow me. Mike enjoyed it though and found that it was reminiscent of his grandmother’s. The kielbasa (Polish sausage) was delicious and the casing had a nice snap to it when I bit into it. Make sure you get a bit of sauerkraut with each bite of kielbasa. It’s a tasty combination! 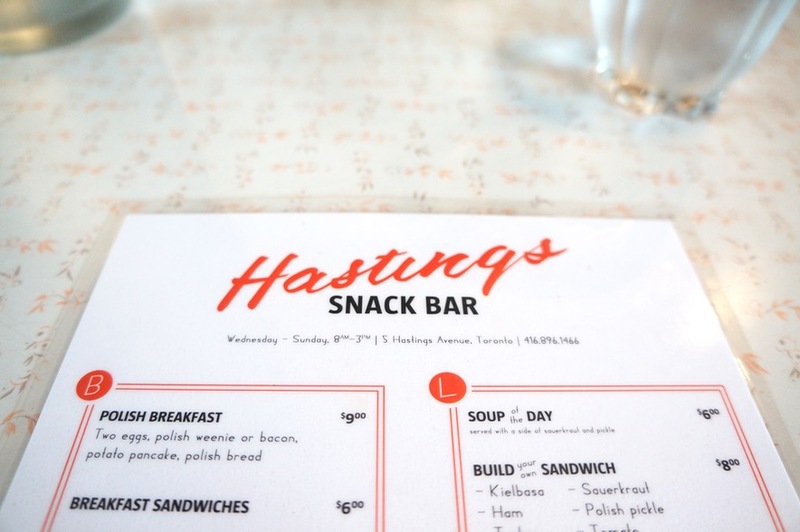 The food and atmosphere at Hastings Snack Bar was so homey and comforting, we couldn’t help falling for this charming spot. We’ll definitely be back to get our pierogi fix.